A former weekly editor who quit journalism to take up a career as a novelist is set to have his second book published. Stuart Robertson, left, who used to edit the Rossendale Free Press, will release ‘If ever I fall’ next month. The book, published by Avon, explores the breakdown of a marriage following a past trauma. Stuart left journalism after more than a decade to become a stay-at-home-dad and pursue his dream of becoming a fiction writer. Stuart, whose debut ‘Time to Say Goodbye’, was published last year, said: “I think it was hard to write in terms of the story line was more complex to the last one. My last book was very linear whereas this one starts in present and works backwards into the past. “I was flexing my writing muscles a bit more with this story. I gave myself a target of writing a certain amount of words every day until I got the book done. “It is very different from being a journalist, the writing style is different and the pace of writing is different. I feel the style of writing is more of my niche. 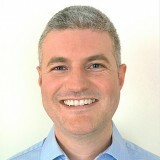 Stuart’s last title sold more than 80,000 copies and was translated into 10 different languages, as well as pent six weeks in the Amazon Kindle top 20 in 2016.